This terraced holiday cottage in Borth-y-Gest is available for self-catering holidays or short breaks throughout the year. 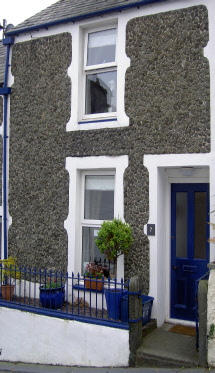 7 Mersey Street is a terraced cottage situated in the heart of Borth-y-Gest, just a few minutes stroll from sandy beaches, tea-room and excellent licensed restaurant, and is also a good centre for touring Snowdonia and the Llŷn Peninsula. Lounge / Diner:- Two comfortable settees, wooden round dining table and four dining chairs, small coffee table and cupboard unit. Flat screen TV with dvd player and Freeview. Gas-fire. Kitchen:- Attractive wooden fitted units, cupboards and sink unit, electric hob and oven, fridge, washing machine, microwave, crockery and cutlery. Main Bedroom:- Double bed, side units, wardrobe and dressing table. Duvet provided, but not bed linen. Second Bedroom:- Adult sized bunk beds, dressing table and also collapsible bed. Bathroom:- Bath with shower, sink and towel rail, separate WC.